Pack for a Purpose is delighted to share this story from Curacao. Santa Barbara Beach & Golf Resort has been partnered with PfaP since 2014, and we are glad to see our connections coming together to make a Big Impact for children at the Divi Divi school. Read the full story below from Ilona Faas de Bruijne, executive assistant to the general manager at Santa Barbara Beach & Golf Resort. 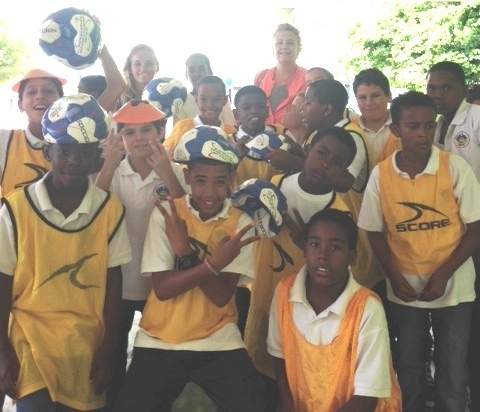 “A few months ago I read on Facebook a message from Anneke, sports teacher at Divi Divi School here at Curacao. The Divi Divi school is a school for children with learning difficulties, most of them experience a rough start in their young lives, due to family circumstances. She reached out to all of us as she has hardly any sports material, no balls, no cones etc. As I remembered Rebecca Rothney from Pack for a Purpose told me that she had contacts at Passback Soccer so I reached out to them. They packed a box with soccer balls, cones and vests and send them over. Unfortunately the box got stuck in Miami, but after some emailing back and forward we finally got the box here in Curacao. When I wanted to drop the box off, Susan mentioned that she had some tennis balls I could bring along for them too. I must say it was my pleasure to meet Anneke and the kids, and I hope we can bring more in the future!